Using aloe vera, you will never deal with raccoon eyes ever again! Unlike store-bought makeup removers, aloe vera gel contains zero chemicals that will irritate the skin! Ideally, you want to use fresh aloe vera gel, not the store-bought kind. Apply a dollop of the gel on a cotton ball. Wipe the makeup clean with the gel and let it sit for several seconds. Get a clean tissue and wipe the melted makeup off. Want smooth, fuzz-free legs? Use aloe vera gel as a substitute for shaving cream! Aloe vera gel contains antibacterial and antiviral properties that heal irritated skin. The gel is light and smooth, preventing nicks and razor burns. It leaves the skin supple and hydrated too! 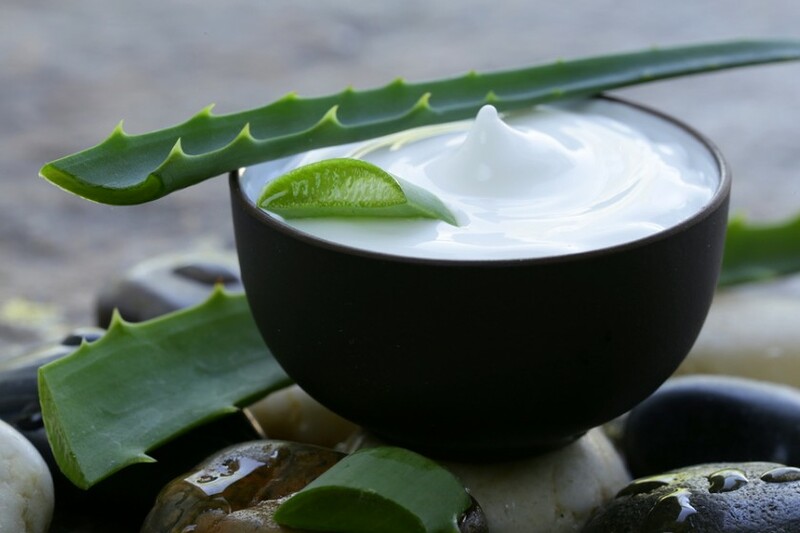 To use aloe vera gel as a shave cream, apply a generous amount on the leg. Because it’s fast absorbing, you have to move fast after the gel is applied. Shave normally as you would, keep adding more if needed. You can also mix the gel with your favorite castile soap and use the mixture as a DIY shaving cream. Are your peepers a little puffy after a night out with the girls? Don’t worry, aloe vera gel will bring life back to your eyes! You can either smooth over the gel under the eyes or freeze it on an ice cube tray and apply. Aloe vera gel will constrict the blood vessels, eliminating puffiness and tightening the skin. Aloe vera makes a great facial wash when you’re in a pinch! Mix fresh aloe gel with a teaspoon of almond milk and lemon extract. Now apply the mixture on the face and massage it in for a minute or two. Wash the mixture off to reveal glowing, smooth skin! Aloe vera fights blemishes thanks to its antibacterial and antimicrobial properties. Meanwhile, almond milk hydrates the skin and lemon extract melts dead skin cells off the surface of the skin. Don’t let halitosis bring you down! Dissolve about ¼ cup of pure aloe vera gel with water or apple juice. Drink the mixture once daily to freshen breath. Aloe vera contains B-sitosterol. This anti-inflammatory compound fights bad breath while promoting better digestion. There are cases wherein halitosis is caused by gut bacteria. Aloe vera gel re-balances the bacteria in the gut, deodorizing your breath. Tired of dealing with unruly, stubborn brows that won’t stay in place? Get a clean, disposable mascara wand and dip it in aloe vera gel. After defining the brows, give them a good sweep of aloe vera gel and let dry. The brows will stay in place all day until you remove the gel. Aloe vera gel is light, fast-absorbing and hydrates deeply! Just apply a generous amount of the fresh gel on dry patches. Let the gel absorb completely by giving yourself a mini massage.